There is a little road named after Beethoven in Vienna, the Beethovengasse, in the 9th district. It is interesting to note that it is quite short and one-way, a bit like the Beethoven street in Paris. As well as this, the road bends, just as the road in Paris did before 1876. 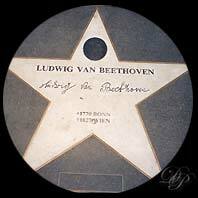 In Vienna, stars on the pavement are dedicated to great composers.